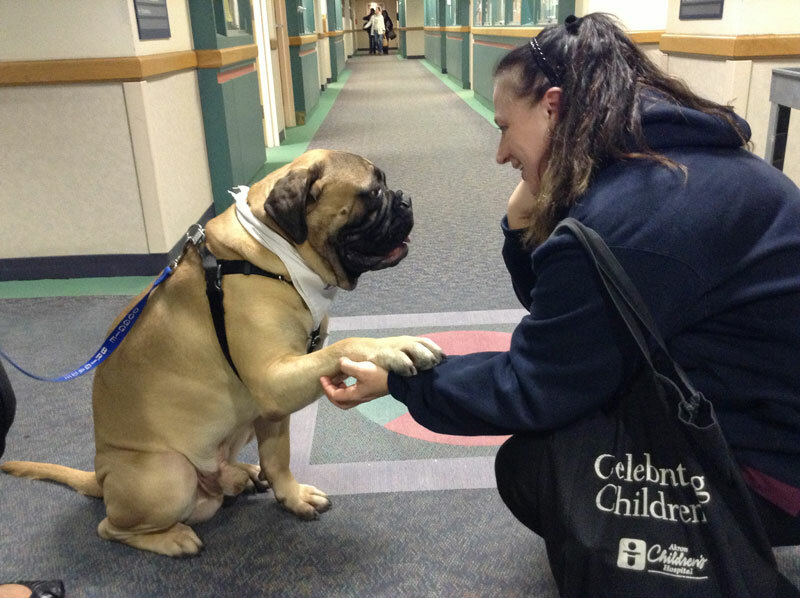 Akron Children’s employee Ellen Chastman shakes hands with Clark. Ever the ambassador, it was Clark who initiated this greeting. Rhea Bateman was in a familiar place and replaying a scene that has unfolded countless times in her 20 years at Akron Children’s Hospital as a volunteer with the Doggie Brigade. She was stalled in a hallway crossroads on the third floor of the hospital. Her 17-month-old Bullmastiff, Clark, was on center stage. Everyone who wandered by was drawn to Clark, who genuinely loved the attention while simultaneously putting out a vibe of serenity not often found in a dog his size. “It has always been the case that getting to and from my assigned floor often takes awhile,” Rhea said. Clark is the eighth dog Bateman has blessed with the program. She’s not one for small dogs. Clark is her sixth Bullmastiff to complement two Great Danes who have participated in Akron Children’s Doggie Brigade. Rhea added that she’s been fortunate to always have a dog at home who could pass the screening when one of her other dogs has had to retire. Treating patients like kids. The lighter side of care.